Update: 2 pups already secured with deposits. Please contact us for more pictures and information regarding the remaining litter. Taking contact details for interested parties. (Pictures are from previous litter - more to follow) Viewings by appointment and only after the pups are 5 weeks old. 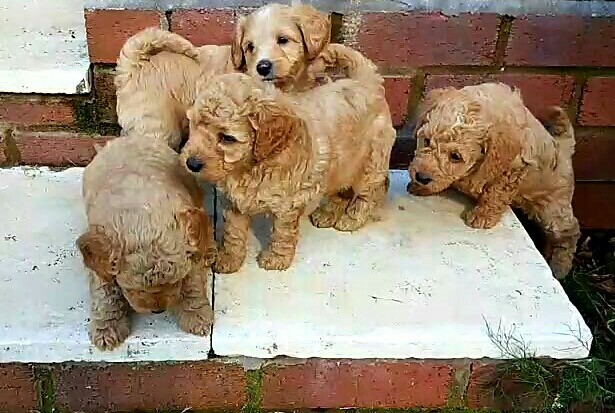 Stunning litter of red Schnoodle puppies. 3 Boys and 2 Girls. Mum is a white Schnoodle and Dad is a KC Registered Miniature Red Poodle that is prcd-PRA hereditarily clear - meaning all off spring are clear also. Dad is also cleared for the following: Malignant Hyperthermia Von Willebrand disease Type 1 Degenerative Myelopathy Macrothrombocytopenia A copy of Dad's KC Certificate will be issued with each pup. Both parents are family pets and as such are well socialised, friendly and with good temperaments. The puppies have been brought up in our busy kitchen, being exposed to normal house noise, smells and sounds. Our two children make sure they get plenty of love and affection! This is where they live and this is where you will see them - no set up viewing area or fake farm scenarios here. These are family pets brought up with a family. The litter turns 8 weeks old on the 4th May 2018. They will not be available until after this date - at a time suitable to yourselves. Puppies will come wormed, microchipped, Vet checked and with 4 weeks Petplan insurance. A 3kg bag of premium puppy food will also be provided to get you off to a good start, together with a blanket that has mums' scent for the pup's comfort. Please consult with your own Vet which vaccine they use so we can administer the right one (2 different types are NOT compatible and not all Vets offer both - this could mean having to start the process again) Puppies can be reserved for 300 non refundable deposit. Please call Jo or John for more information or to arrange a visit to our home.